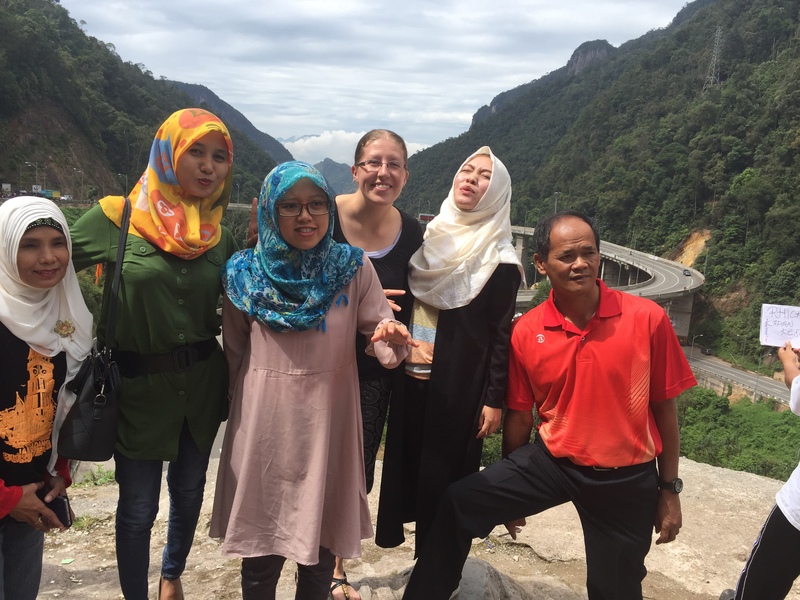 Less than two months remain for the 2015-2016 cohort of Fulbright English Teaching Assisstants. February and March are popular months for ETAs to complete some of their mandatory projects, including the WORDS Competition (read about the 2014 and 2015 national competitions in the preceding links) as well as a teacher training workshop completed in collaboration with English Language Fellows. 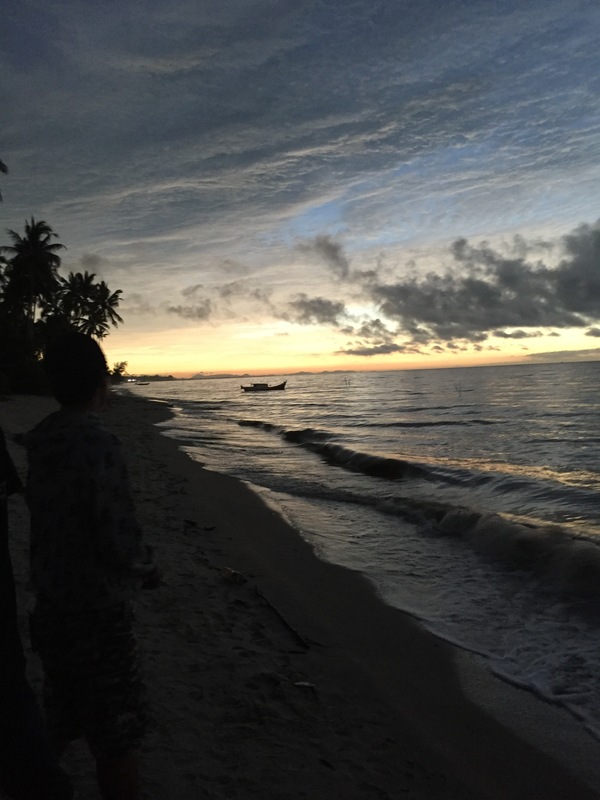 This month’s highlights feature many of these activities, though Indonesia’s ETAs have had plenty of other projects and community engagement activities to keep them busy in their final months. ETAs Julia Xia, Kendra Reiser, and Bryan Howard hosted an English Teaching workshop featuring RELO English Language Fellow Sean Stellfox. The workshop focused on lesson planning and interactive and engaging classroom teaching activities. English teachers from SMAN1 Yogyakarta, SMK6 Yogyakarta, and MAN Wonosari attended the workshop, worked with ETAs to practice lesson planning according to the PPP model, and received many new games and exercises and worksheets that they could directly apply in their classrooms. 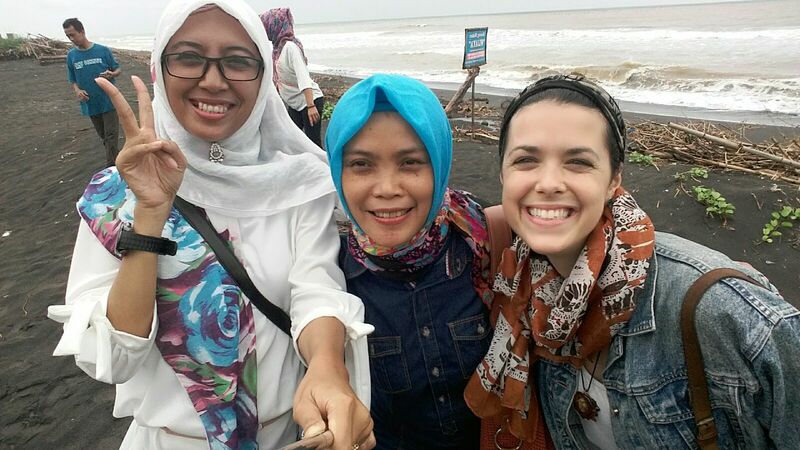 ETA Savannah Trifiro accompanied teachers and administrators from her school to Pantai Depok in Yogyakarta where they shared a meal of fresh fish and other Indonesian delicacies. Despite the cloudy weather, many photos were taken on the beach. On the way back to Magelang, Savannah and members from SMKN 3 Magelang stopped for leather and oleh-oleh shopping, where she tried bakpia (mung bean-filled sweet rolls) for the first time. 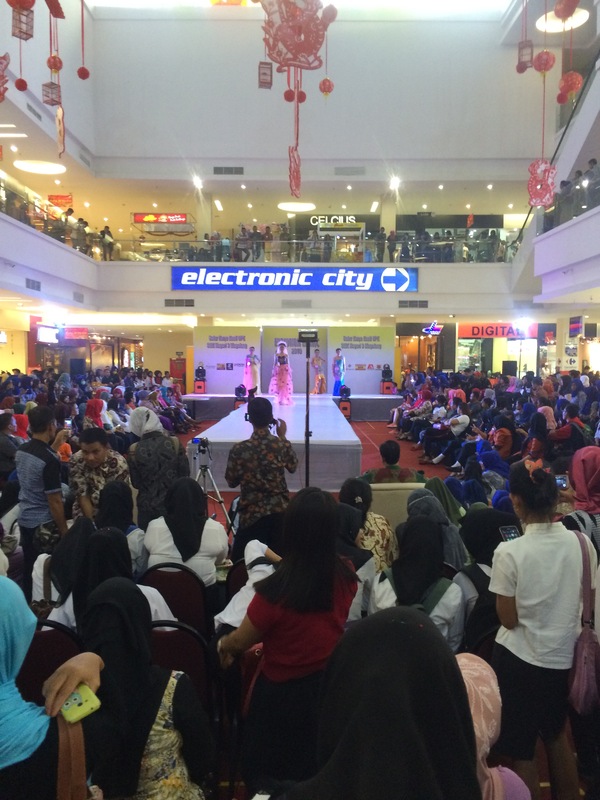 ETA Savannah Trifiro attended SMKN 3 Magelang’s class XII fashion show and student exhibition at Artos Mall. Many of her class X and class XI students were also participating in the event to ensure that it ran smoothly. 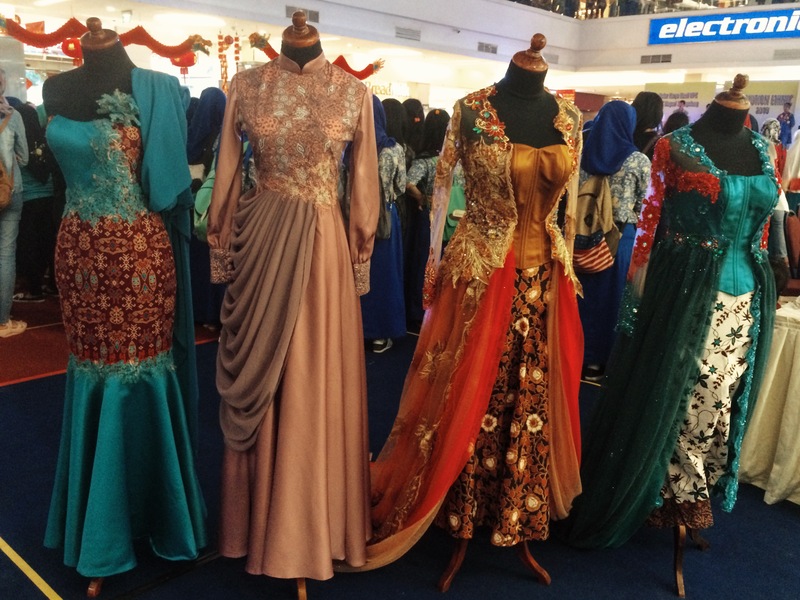 Members of the school and community were invited to watch the show, which showcased beautiful dresses, hair, and makeup all created by the students of SMKN 3 Magelang. 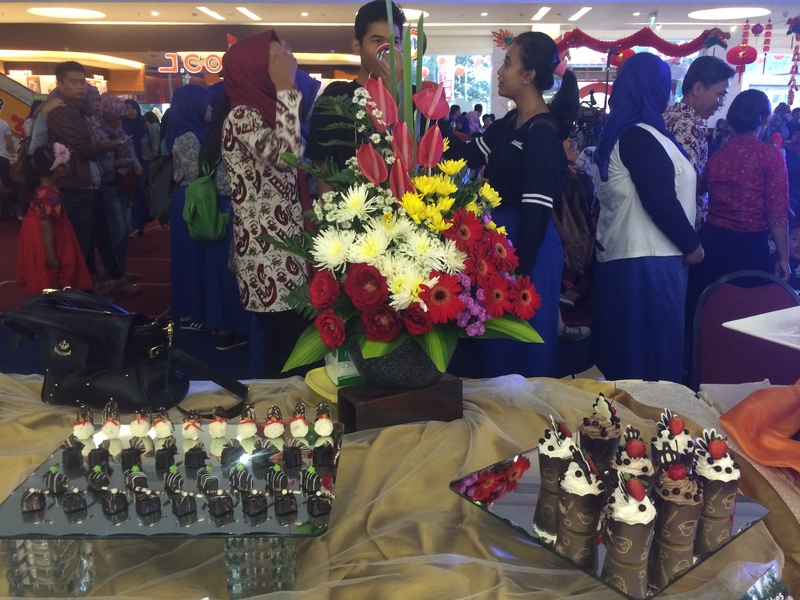 On display were also traditional Indonesian delicacies made by the culinary students at Savannah’s school. The exhibition was a great success and Savannah was incredibly impressed by and proud of the many talented students of SMKN 3 Magelang and their hard work. 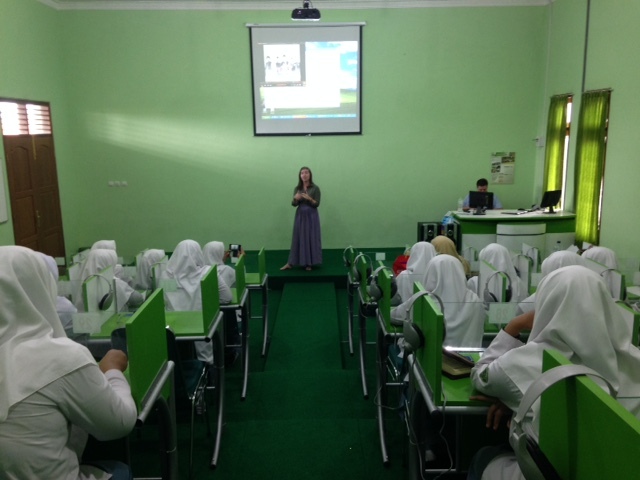 ETA Savannah Trifiro held her local WORDS competition at SMKN 3 Magelang in late February. After a month of preparation, 8 brave students shared their speeches and talents. Although selecting one winner was a challenge, Ni Kadek Henanda Iko Fityesti of Kelas X Kecantikan Kulit (beauty class X) will accompany Savannah to Jakarta to compete in the national event. ETA Rebecca Selin at SMKN 2 in Bandar Lampung taught several Black History Month lessons to her students in classes 10 and 11. For class 11, she incorporated passive voice into a lesson on discrimination, Rosa Parks, and the Montgomery Bus Boycott. Students were shocked to hear about the history of discrimination and racism in America, and had many interesting questions and comments. After completing a reading activity, Rebecca’s students acted out the legendary story of Rosa Parks’ arrest for refusing to give up her bus seat. In the picture, students from XI TP1 (Mechanical Engineering) play the bus driver, Rosa Parks, a white passenger, and a police officer. 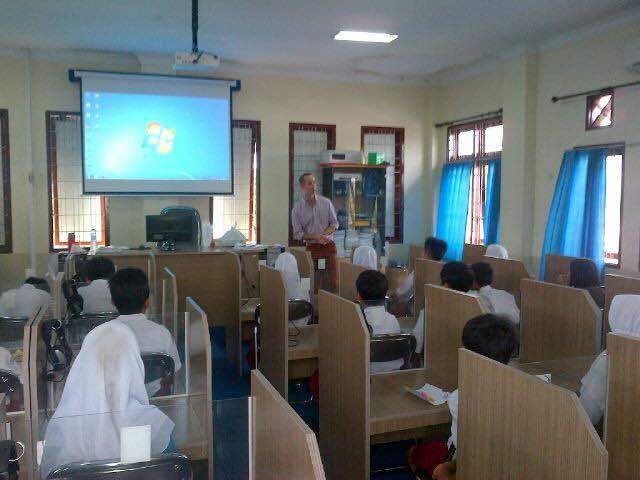 ETA Bryan Howard visited another senior high school in Wonosari, SMA Negeri 1 Wonosari, so that students could practice speaking with a native English speaker after being invited by English teacher Bapak Slamet Riyanto. 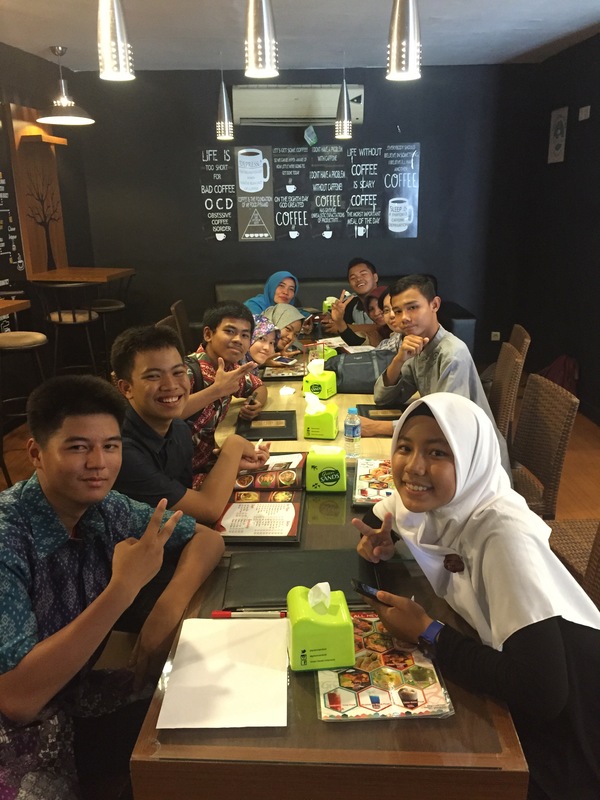 Over two days, Bryan visited all 13 grade 10 and 11 classes in the nearby SMA 1 Wonosari. For 30-45 minutes with each class, Bryan presented on high school and university in the United States of America and then had a question and answer session about education and culture in the USA as well as his experiences in Indonesia. 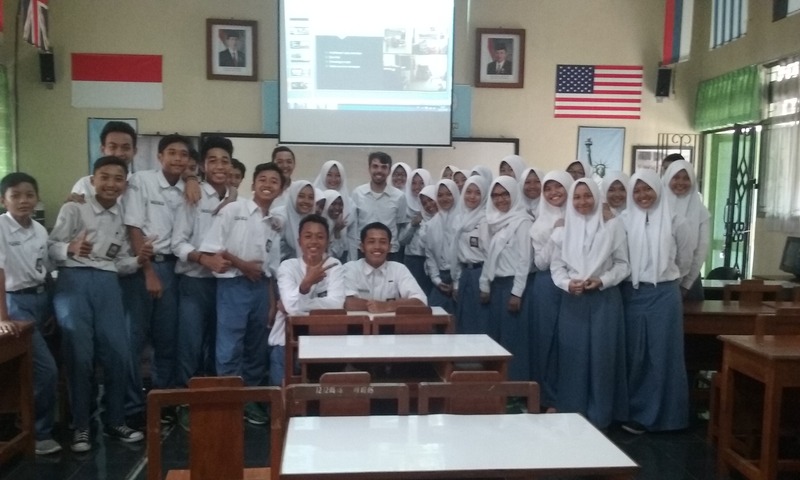 Topics included discussion of cultural differences inside and outside the classroom, national exams in the United States, course schedules in the USA, the perception of Islam in America, and his favorite Indonesian song (Tetap Dalam Jiwa). He had a wonderful time speaking entirely in English with all of the students at SMA 1 Wonosari and encouraged them to stop him and chat whenever they see him riding his bicycle around town. At SMA CTF ETA Christopher Linnan and his English language co-teachers helped organize and plan the SMA CTF WORDS Competition. 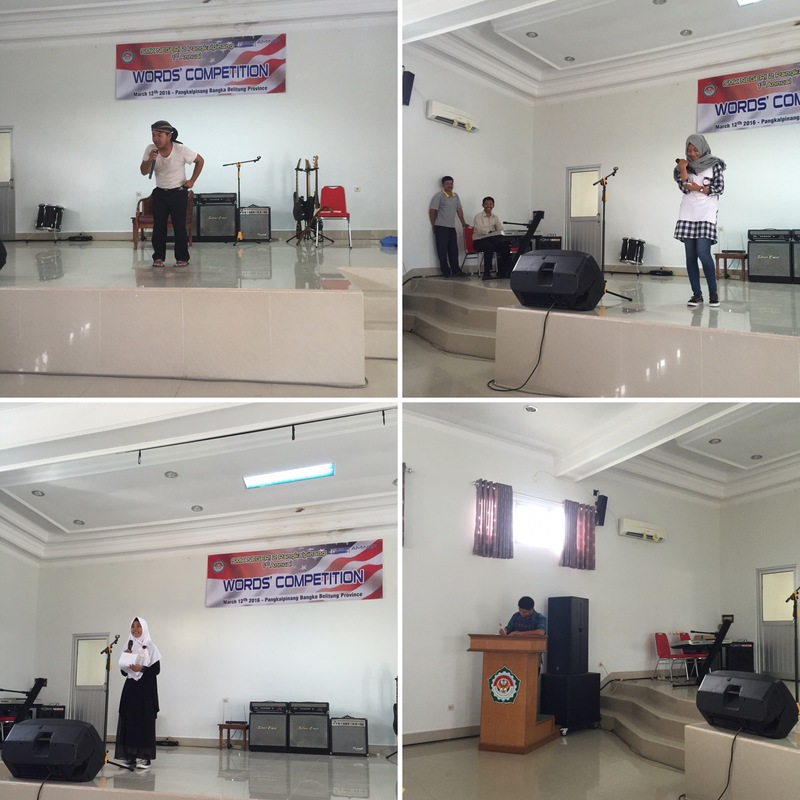 This is an English language speech and talent contest sponsored by AMINEF (American Indonesian Exchange Foundation). The competition was a roaring success as 22 students gave passionate and inspiring presentations after a month of preparation. Christopher’s competition was especially successful because the judges included the local English Language Fellow Sheridan Honore, and two fellow ETAs, Chris’s amazing site mate Izaak Earnhardt from SMK Binaan Medan and the incredible Kelly Fitzgerald who is an ETA in Pangkal Pinang. All the judges were huge hits with the students, teachers, and staff of SMA CTF. The SMA CTF WORDS winner, Desi Rahmuni, will accompany Christopher to Jakarta to take part in the national event, but in the meantime they will spending a lot of time preparing! Many of ETA Izaak Earnhardt’s friends in Medan are teachers or others who work for Dinas Pendidikan. On Thursday, 3 March, Izaak visited the classes of several friends at SD Pertiwi to talk about the importance of learning foreign languages like English, Chinese, or French. Even though the students were still in primary school, some of them had big dreams, including one who wanted to become a professor of mathematics. 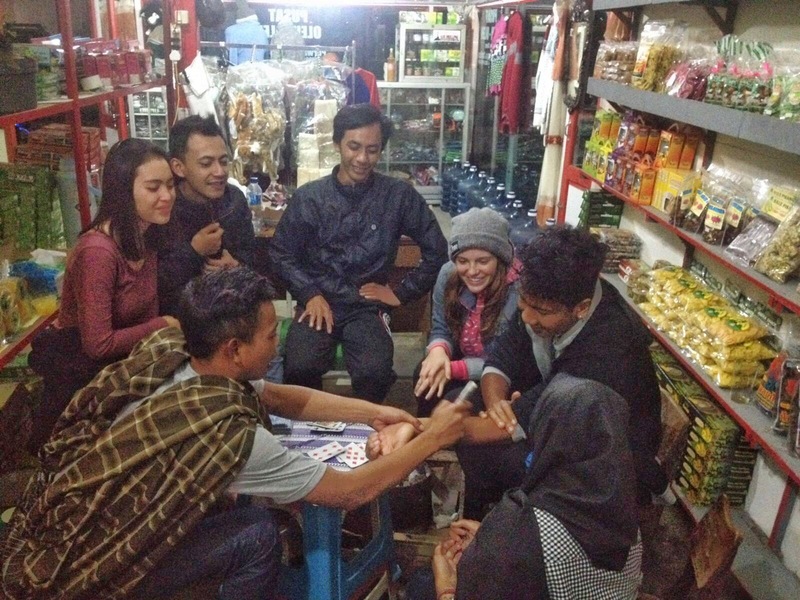 While late night jalan-jalaning, ETA Kendra Reiser and some friends ran into some super keren [cool] Indonesian college students playing some cards in an oleh-oleh store. In typical Indonesian fashion, they were hospitable sekali [very] and taught Kendra and her friends how to play remy and Indonesian war. No gambling involved but the loser had to let every other player sign something on their arm, which is what you see in the picture below. It was freaking fun. 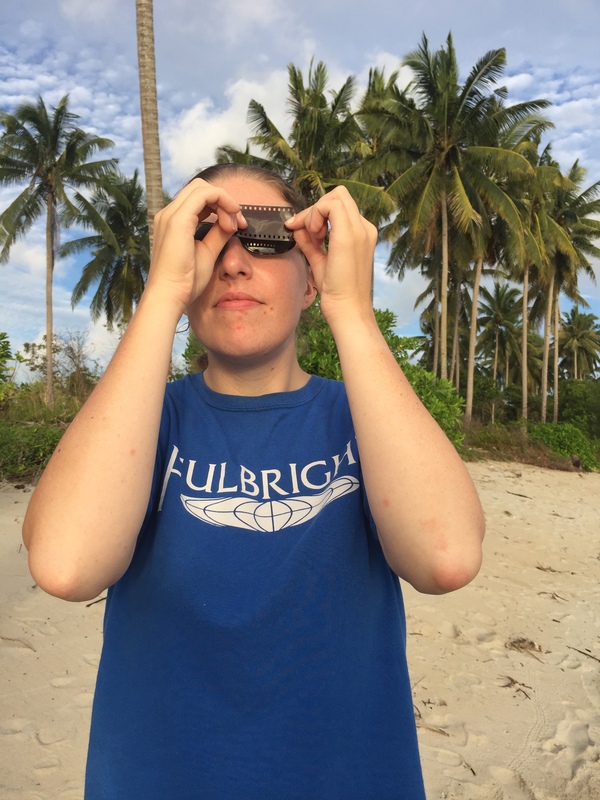 Bangka Tengah, or Central Bangka, was lucky enough to be directly in line of the historic total solar eclipse on 9 March 2016 and there was no way that ETAs Caitlin Jordan and Kelly Fitzgerald were going to miss it. They traveled with friends from Pangkal Pinang to experience the event in Terentang, the main hub of events surrounding the eclipse. 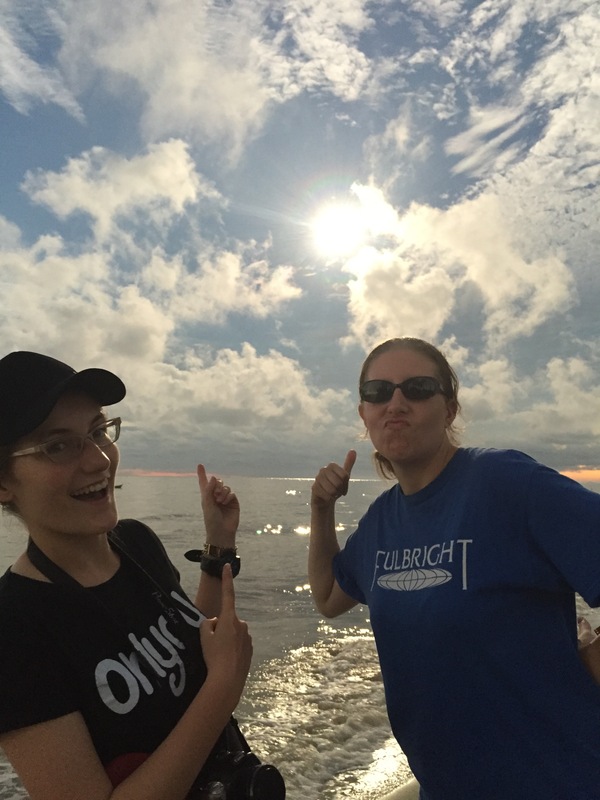 Caitlin and Kelly managed to get there in time to watch the sunrise and process of the eclipse from start to finish. Caitlin, Kelly, and their Indonesian friends watched the eclipse through pieces of camera film so as to be able to look directly at the sun as it disappeared completely. When the sun was entirely covered at around 7:30 am, the sky went dark and a huge cheer went up from the massive crowds that lined the beaches for miles in all directions. It was an amazing moment and a first for both ETAs, who never thought they would have this kind of first experience halfway across the world! 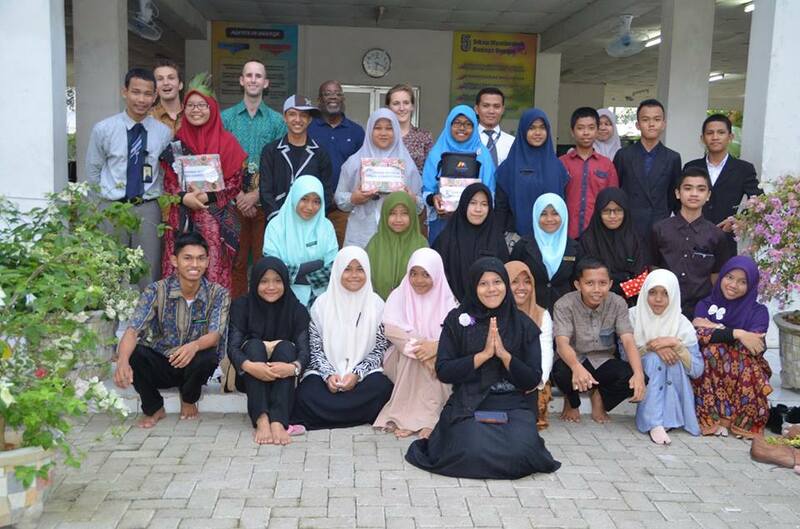 ETA Patrick Dougherty recently held an English speech competition, WORDS, at his school SMAN 3 Martapura. Twelve students from tenth and eleventh grade participated, showing off their English Language skills as well as their individual talents, which ranged from traditional dance to MC-ing to storytelling. Only one student, Vedra Putri, won an invitation to participate in the national competition in Jakarta this April. She will accompany Patrick and compete against over thirty students from across Indonesia. After Patrick’s local competition, he wanted to treat his students to a nice lunch to reward them for their hard work in preparing their speeches (for many of them, it was the first time they’d written a speech, in any language!). They all went out to a local restaurant near school and ate, and shared their experiences of speechwriting and learning English. 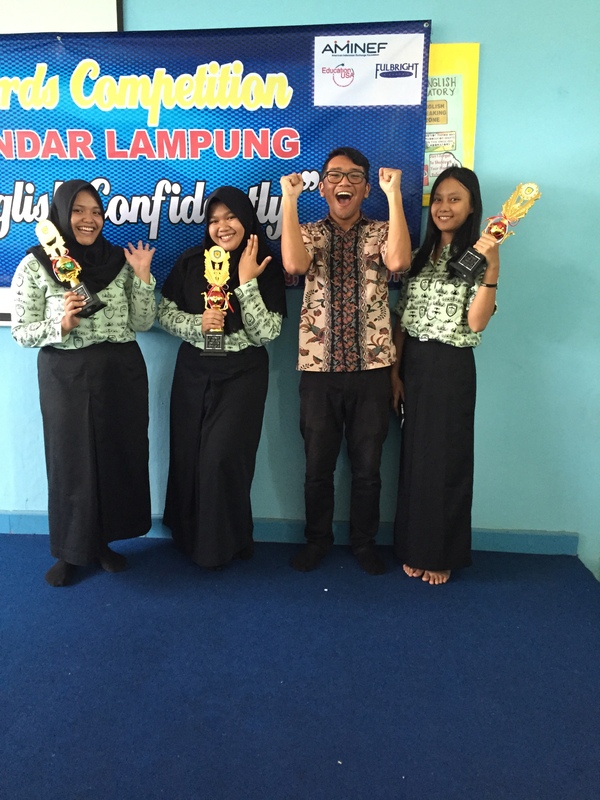 At SMAN 7 Bandar Lampung, ETA Ramon Caleon and his English language co-teachers co-organized the first local SMAN 7 Bandar Lampung WORDS Competition. With 9 students participating, the competition was small but terrific; all the students, ranging from Classes 10 and 11, gave articulate and impressive speeches explaining their three wishes. ETA Ramon Caleon helped these students prepare for the competition through regular coaching sessions that started a month prior. The great success of the event was also in part due to the eclectic committee of judges: ETA Rebecca Selin from SMKN 2 Bandar Lampung, Fajar Kurniasih, a SMAN 7 alum who regularly participates in speech contests, and Habib Ali Dengi, a local writer and musician. 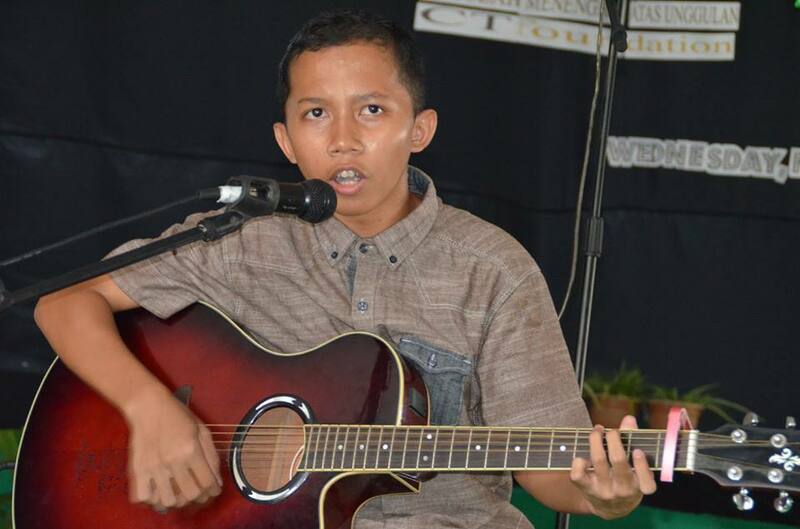 Ramon Caleon will continue training and eventually accompany the winner, Gina Andani to Jakarta to participate in the competition’s national level. 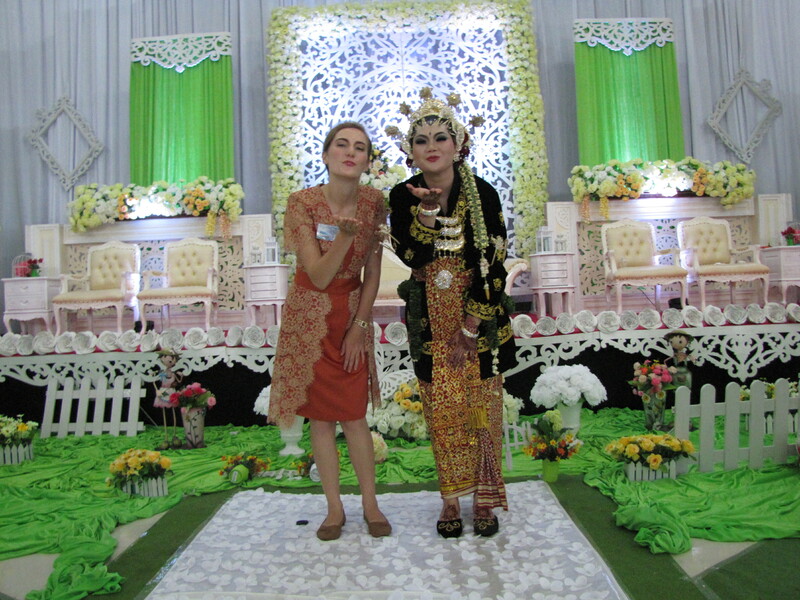 ETA Rebecca Selin and her coteachers planned and hosted the SMKN 2 Bandar Lampung WORDS competition. After weeks of preparation and anticipation, 13 students from a wide variety of vocational concentrations competed in the English speech competition. They showed an incredible amount of creativity and panache in their speeches and talent presentations. The students, who study vocations including motorcycle repair, woodworking, mechanical engineering, and architectural drafting, truly showed that “SMK Bisa” with their insightful speeches and impressive talents. The judge panel included ETA Ramon Caleon and two English experts affiliated with a local university. The students enjoyed this opportunity to work on their English. The winner, Mutiara Puspita Syari, will attend the national WORDS competition with Rebecca. 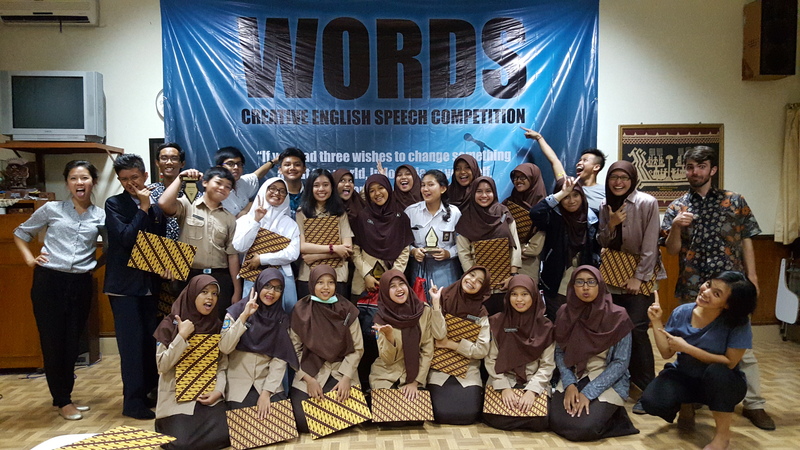 On Saturday March 12, 2016, ETA Julia Xia hosted the 2016 WORDS competition at SMAN1 Teladan Yogyakarta. Twenty-four students piled into the multimedia room of SMAN1 with guitars, poems, Javanese dancewear, a cello, and a Wu Shu sword to accompany their creative speeches about their three wishes to change something about the world, Indonesia, or themselves. The students of SMAN1 bravely used the WORDS competition as a platform to talk about issues like education, the environment, preserving old traditions and embracing modern values, poverty, health, and even perceptions of beauty. It was an unforgettable night of talent, creativity, and extremely mature discussions of world issues. The judges of the competition consisted of Bryan Howard, an ETA in Wonosari, Andis Saputra, alumni of SMAN1 and former YES student, and Melati Kaye, environmental reporter. 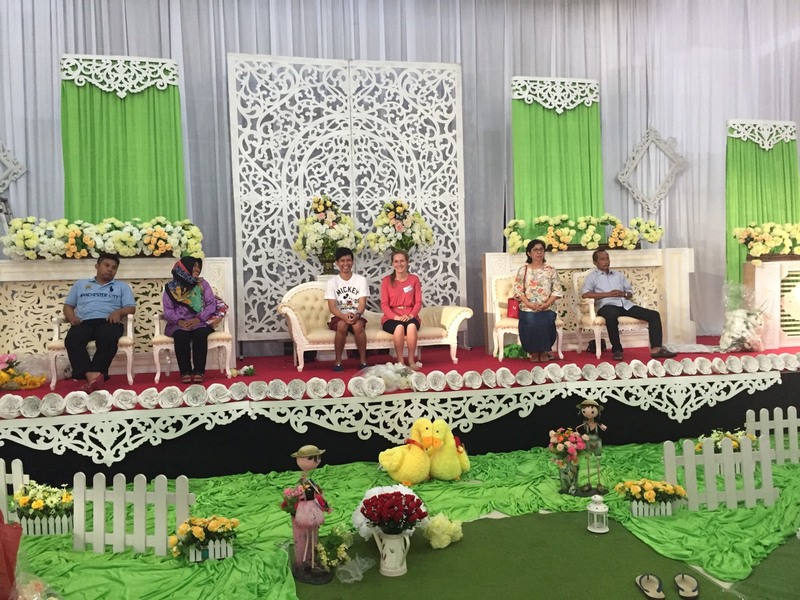 SMKN 2 Pangkal Pinang’s first WORDS competition was a great success – especially considering the day of the event was in the middle of a school holiday for the 10th and 11th grade. The nine students who participated, most of whom were from grade ten taught by Caitlin, did a great job giving their speeches and showing off talents that ranged from drawing on stage to beatboxing to storytelling. Fellow ETA Kelly Fitzgerald and two English teachers, Pak Alex and Ma’am Isnaini, from SMAN 3 Pangkal Pinang were the judges and Pak Dida of SMKN 2 (the best counterpart an ETA could ask for) MC’ed the show. Caitlin was so proud of all of the students for giving their best efforts despite being nervous to speak in front of an audience! Afterward, Caitlin treated everyone to lunch at D’Grande Cafe and the participants later received certificates and prizes. 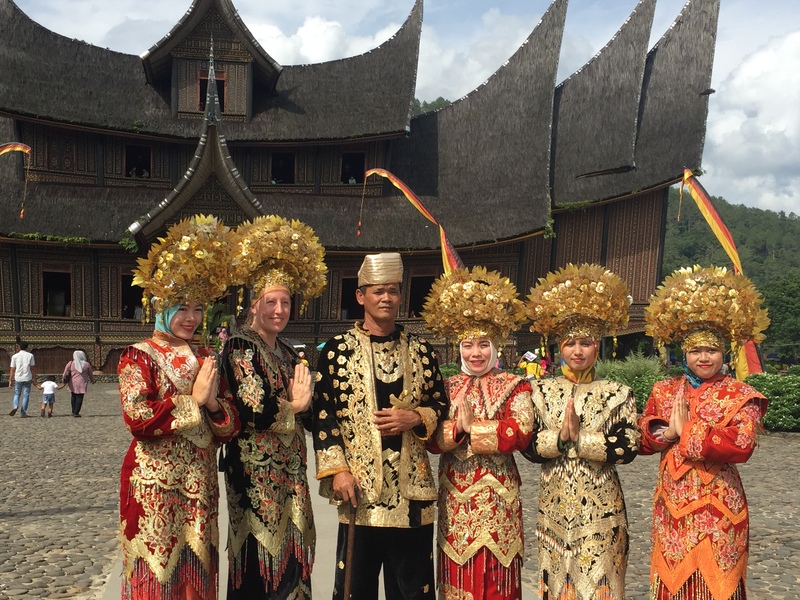 Pangkal Pinang’s ETAs Kelly Fitzgerald and Caitlin Jordan were part of penitia souvenir, or the souvenir committee, for the wedding of the year in Pangkal Pinang. The headmistress of Kelly’s school, SMAN 3 Pangkal Pinang, enlisted all of the teachers to help with her son’s wedding. Kelly and Caitlin were given fabric to have uniforms made, attended planning meetings in the weeks before the event, went to the rehearsal the day before the wedding (Kelly was the stand-in bride for the practice ceremony because the real bride had other business), and arrived at 6 a.m. on the big day to do their hair and make-up and help with final preparations. During the wedding itself, Kelly and Caitlin stood at two different doorways and greeted more than 2,000 guests. It was a massive, Javanese-style event that neither of them will soon forget! 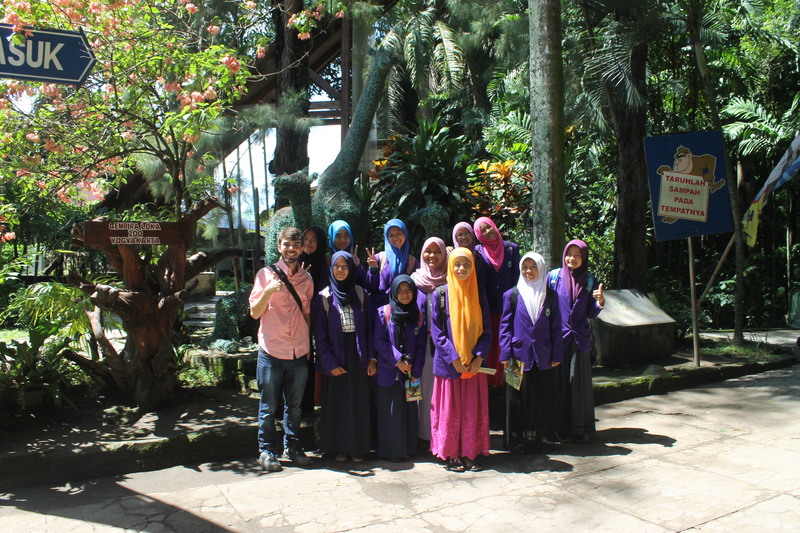 ETA Bryan Howard and fellow English teacher Pak Rifa took the eleven students in the MAN Wonosari English club to the Gembira Loka Zoo in Jogja. The students went to the zoo to film videos for “Thousands of Islands, Hundreds of Voices,” a project involving 20 ETAs. Each ETA/student group will create videos to expose English speakers from around the world to Bahasa Indonesia as well as various local languages from across the country. MAN Wonosari wanted to teach animals and their habitats in Bahasa Indonesia as well as Wonosari’s local language, Bahasa Jawa. 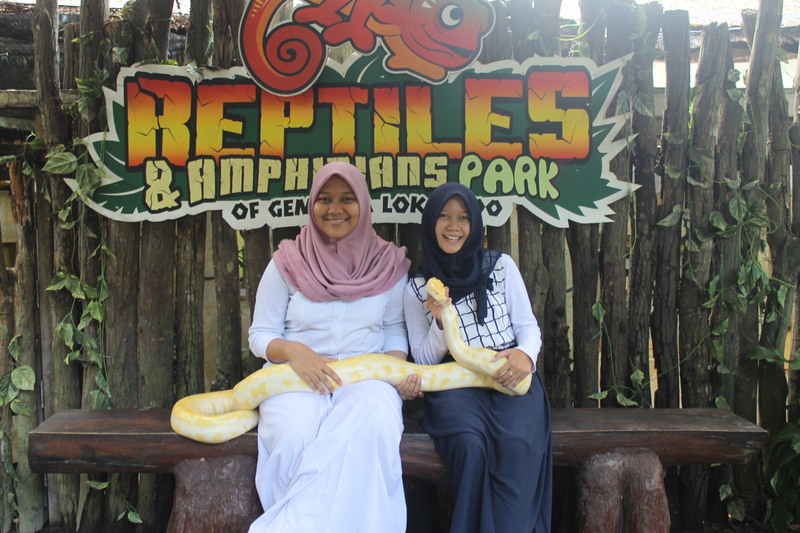 To do this, the students decided to invite viewers to join them on a trip to the zoo. In the videos, the English Club teaches various animals including snakes, elephants, and goats. Everyone had an amazing time, and we cannot wait to share our videos with the world in a few months! 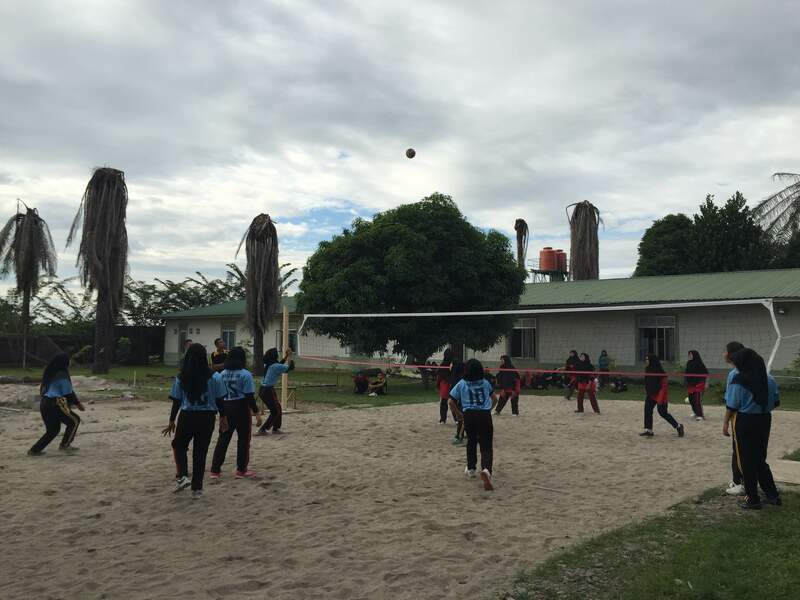 Both SMKN Binaan and SMA CT Foudation in Medan have highly athletic students who compete with schools across the city in volleyball, basketball, and futsal. The ETAs at those schools, Izaak Earnhardt and Christopher Linnan cheered their respective schools during a recent volleyball game between their schools at SMA CT Foundation on March 15. Izaak was delighted to see some of his students from SMKN Binaan soundly beat the team from Christopher’s school. ETA Caitlin Jordan was invited by the headmaster of SMKN 2 Pangkal Pinang, Pak Yul, on a four day school visiting trip with 13 other staff and teachers to Padang and Bukit Tinggi in West Sumatra. Two days were spent visiting schools in the area and Caitlin took on the role of being ETA Ambassador; passing on information about the program to the schools, as well as making plenty of new friends. The other days and hours were spent touring the area, and included visits to a famous bridge called Kelok 9, the Pagaruyung Royal Palace (where she and some of the staff dressed in traditional West Sumatra royal robes), and tunnels built by the Japanese during their occupation of Indonesia in World War II. It was a wonderful opportunity to bond further with some of the teachers of SMKN 2 and learn more about Indonesia’s rich history. Miss Jordan hopes that more traveling with her school can happen soon! 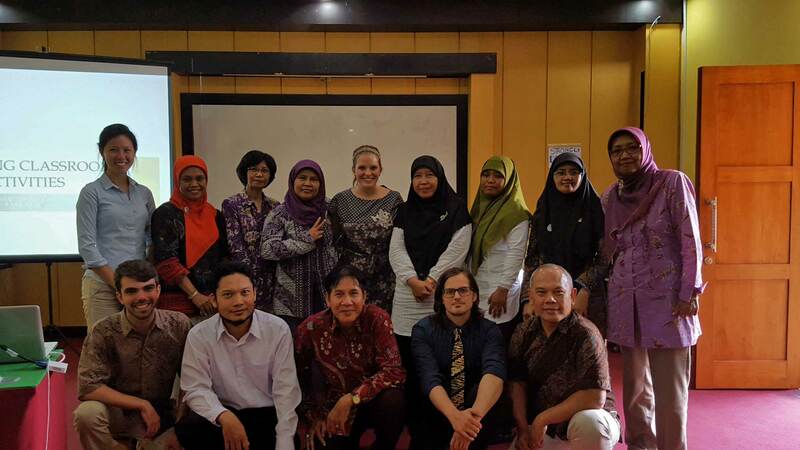 On Friday, 18 March, 2 teachers from SMKN Binaan attended an intimate teacher training with the English Language Fellow (ELF) from Universitas Muhammadiyah Sumatera Utara, Sheridan Honore. ETA Izaak Earnhardt planned the training with Sheridan in order to best meet the needs of the teachers at his school. The training covered classroom management, pedagogical methods, and ways to make language classes more engaging. Participating teachers also received materials from AMINEF and the Regional English Language Office (RELO). On Monday, March 21st ETA Safiyah Ismail held a Language In and Out of the Classroom session with her 11th grade students. Two English Language instructors from America were invited to facilitate the discussion and break into small groups to discuss their personal experiences studying abroad while in university. Students asked questions about funding opportunities for studying abroad, how to go about finding halal food in countries other than Indonesia, and the perception of Muslims in Western countries. 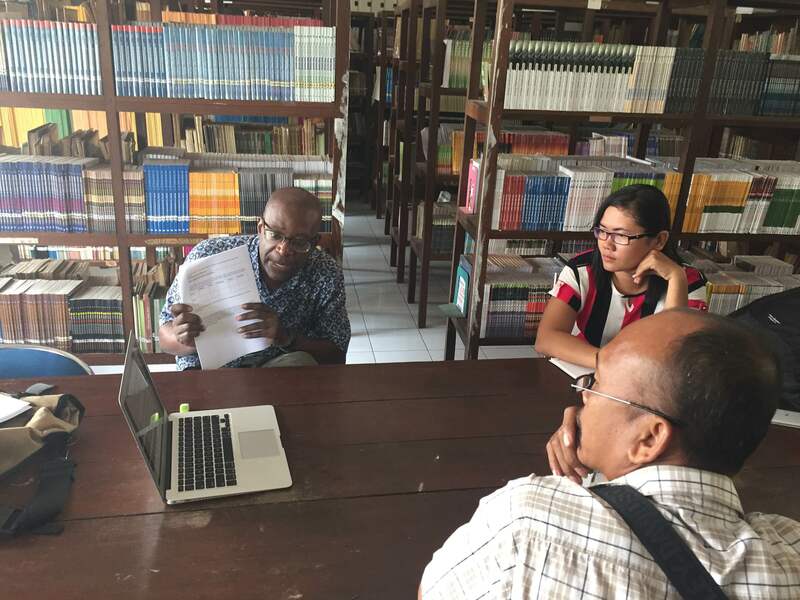 Students in grade 10 at SMAN 3 Pangkal Pinang are becoming experts on U.S. history. They recently made posters about different events in U.S. history, such as the first moon landing and the election of Barack Obama, during a unit about using past tense to talk about historical events. Their teachers, ETA Kelly Fitzgerald and co-teacher Ma’am Isnaini, are extremely proud of the students and their hard work. Now that the posters are finished, the students will share their projects in a poster exhibition around the school.